2018 through 2022 offer the rich opportunity to touch, integrate and experience 7th and 9th dimensional frequencies and information while still having a body of form. 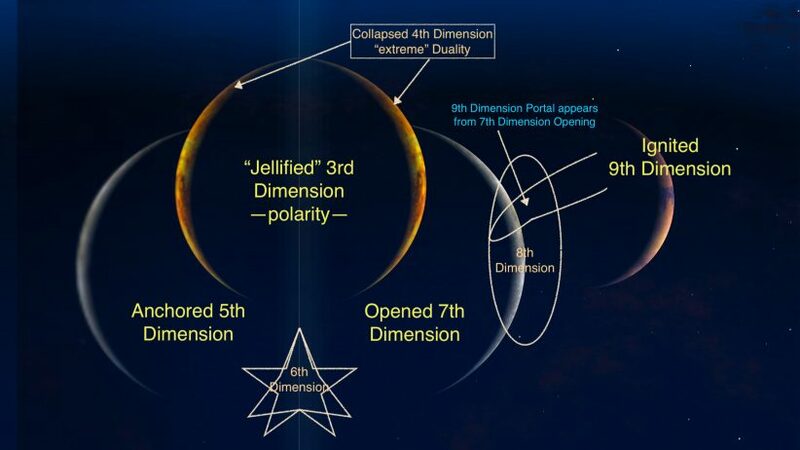 Now that the 3rd and 5th dimensions have fully anchored, the “surprise” was the appearance of BOTH the 7th and 9th dimensional portals! With such vast energies now available, the body is forced to adjust – rapidly- to allow these frequencies to birth through us and offer divine wisdom. These higher dimensional frequencies shift our comfort, change our psychology and require that our emotional bodies be at peace. Without resolving emotional wounds and creating an inner safety it becomes challenging to accept higher frequency energies into our present psychology and physicality. 2018 is the year that will be viewed from the future as an anomaly in the period between 2015-2022. It is a year to ANCHOR STABILITY thorugh Shanti, Bhakti and Ananda! As such the experience of the energies has called forward an EXPANSION of ENHANCED Ascension Energies that are related to the experiences associated with navigating inter-dimensional frequencies. These frequencies are experienced when our upper chakras become open and available to connect into the dimensions that have now opened…and beyond. Now is the moment to relax and call forward ever-greater self-love and acceptance of others into your life, therefore igniting your "boundless-ness". Expansion requires that we transcend our worldly attachments. Most importantly we invite you to remember, you are not insane! Sanity is a social norm. The only "norm" that matters is your love of your Self. These Ascension experiences of Spiritual Awakening are temporary and resolve as you anchor ever-greater love, acceptance and gratitude into your psychology. Your body of form and your emotional body will respond to this healing energy of pure love! The Mastery Experience and How the Mastery Experience Affects you. There are 18 new symptoms that are DIRECTLY ATTRIBUTABLE to MASTERY EXPERIENCES. This is one of the vast distinctions from the symptoms that have been experienced prior to late 2017, (click here to read them). ENHANCED SYMPTOMS of Ascension have arrived in perfect order and at the perfect moment. Through offering yourself the gift of education about what you are experiencing, you break free of the illusion of fear, doubt and negativity. As you ignite this energy through understanding, it calls forward the experience of compassion and understanding, a healing experience that opens the gateway to anchor mastery. You can honestly KNOW when you are experiencing multi-dimensional shifts! First you may wish to watch the video and then afterward review the printed list on this page. For each of the New 18 Symptoms you will first see in Bold type the Mastery Experience being presented. After the heading, in regular type are the types of indicators of the Mastery experience you may be experiencing or are aware of. Bodily Call to Presence! Call to presence from the Body responding to new energies with symptoms of tendonitis...stiffness…sense of imbalance (Less comfortable with the physical world…awkward)…shifting to accommodate higher frequencies as you anchor ascension energy. Connection with Remembering Ascension: Sense of remembering the future as now…seeing things as finished…heightened sense of déjà vu and meeting others who are sharing same experience. Releasing Dimensional Dementia: Inability to call forward the “words” to adequately describe your experience…let go of trying to find the words and simply notice what you are experiencing. Reunification with Soul Family: Connection with soul family and heightened awareness of those who are authentic and those who are not. Mastery through Spiritual Discernment: Harvesting the gift of Spiritual discernment through growth in your journey. Recognition that not everything or everyone with the “right words” is part of your journey as you appreciate their role in bringing you to where you are now. Cultivating your inner wisdom and learning more from the Presence of others and their expression in the world vs. the spin of density. It is your time to live with the blessing of Ascended Sanity instead of Density Sanity. May your heart remember that to those who are in the world of density you will seem insane and be unable to discover support easily for your journey. AND! Once you anchor in your Ascended Presence you will clearly see the insanity of the density and open the portal of compassion for those who are living it. Through that relaxation into your divine nature, support comes effortlessly and community gathers to support you. Being aware of the combined EXPERIENCE OF THE SYMPTOMS Of ASCENSION and Spiritual Awakening relax your mind as you thrive through Multi-dimensional living adventure that is Self-Ascension!